Finally I have a moment to sit down and actually update my blog. Ok so last week we had a our Nuchal translucency screening for Down Syndrome and Trisomy 18. We had an hour long meeting with a genetic counselor. She was very informative and gave Mike and I a lot of scary good information about genetic abnormalities.I'm still not quite sure why they had us see a genetic counselor since we have no major risk factors. I guess they have everyone do it. After that we had the ultrasound and blood work portion of the screening. The tech asked me if a student could sit in on the ultrasound. I of course said yes, and I am so happy I did. It was the best ultrasound I have ever had!! The tech kept teaching the student and it was so fun to learn along with her. After about 45 mins she switched to 3d and 4d. IT WAS AWESOME!! She gave us a TON of pictures. I will admit that it was a little odd when she kept talking in a baby voice to the baby and referring to it as " 'Tinky Poo Poo" but all and all she was pretty awesome, so I'll let her slide on that one. Now, I am well aware that you can't definitively tell what gender the baby is at 12 weeks via ultrasound, but that doesn't make it any less fun to guess. I've done my research on The Angle of the Dangle and feel I am as good as any trained ultrasound tech out there (note the sarcasm). So my guess for this baby? BOY!! I'll let you guess for yourself though. Hand up by face waving to his/her big brother. Standing on his/her head. Doing a little break dancing. So glad your appointment went well! Glad to hear your appointment went well. Adorable pictures! Glad everything went well! I also had a student along for the ride during my US and felt very looked after as they took their time and involved me with the whole process. Very sweet... I don't think I could have tolerated the baby voices. But I'm glad for such a great report for you! Glad everything went well!! OH BOY!!! When do you find out? Great news! I always "allow" students in on appointments b/c you get to learn so much more about what you see. It is a little strange that the tech called your baby "Tinky Poo Poo"...! What sweet pictures! We found out that my son (now 10 months) was an obvious boy at 12 weeks, and that was with a plain 'ol 2d ultrasound so your guess may be correct! I love this photos. So neat!!! I guess boy also. Congrats. 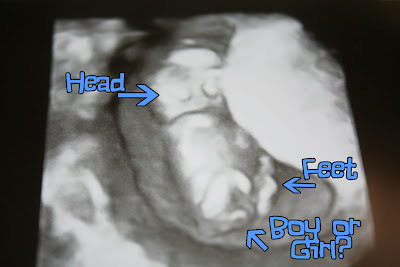 Ummm, I am terrible at ultrasounds, LOL. But there is something there. Perhaps it is the remnants of the "tail"? Or, it's a dangle, as you say. I'm so glad everything went so well! How fun, it's great to live vicariously through your pregnancy. ps. I have two boys ages 7 & 4 and they are the best of friends, so if it is another boy you have a lot to look forward to. So happy everything went well! Love the pictures!!! Great news! I would beg to differ as I thought for sure that it looks like a girl!